Maria Rendon. Photo courtesy of Leela Cyd. The smART Talks lecture series serves to increase awareness of regional contemporary art through a series of three talks a year by local artists about their work, careers, and creative process. Maria Rendón lives and works in Santa Barbara, CA. Her previous solo exhibitions include shows at the Universidad Anahuac in Mexico, and at Mount St. Mary’s College and Random Gallery, both in Los Angeles. 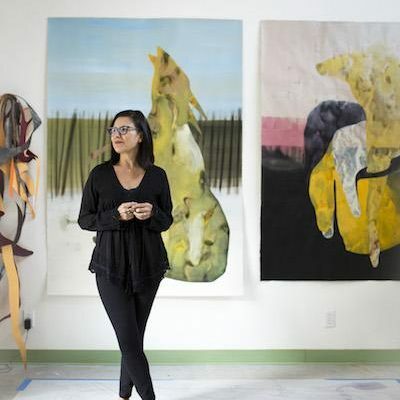 Her work was featured in Crave, an art, food and social experience, at the Contemporary Arts Forum (now the Museum of Contemporary Art Santa Barbara) in 2012. She has also been in many group exhibitions at venues including the Westmont Ridley-Tree Museum of Art, Lotusland, Gallery Nucleus and Santa Monica College. In her work as an illustrator, Rendón has received awards from American Illustration, the Society of Illustrators and the Society of Publication Designers. Her work has been commissioned by many businesses including American Airlines, Capitol Records, Dow Jones, Harvard Business School and NPR. The smART talk series, begun in 1996, was created in honor of Helen Rosenberg, mother of Susan Rose, and grandmother of Julie Weiner, and honors artists who live and work in the Santa Barbara area.